The MC3100 Rugged Windows CE Barcode Kit enables mobile workers to collect data in a batch mode and sync to various back-end data systems bringing cost effective mobility solutions to your existing data collection processes. 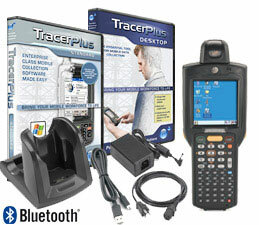 Pairing TracerPlus data collection software along with the rugged and ergonomic MC3100 barcode terminal, retailers, government agencies and distribution centers can streamline and error-proof business processes, improving employee productivity as well as customer service and satisfaction. Using Symbol's successful MC3000 series as a base for development, the MC3100 introduces many new capabilities driving flexibility, affordability, ease-of-use, and ease-of-management bringing system performance to new heights.